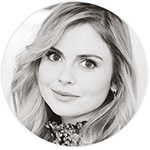 This week, is a big week for Rose McIver. She has been traveling between different sets to speak about her career and the premiere of ‘iZombie‘ season 3 which will air on April 4th. This article will let you to see all the direct links for each TV tray in which Rose went. Be sure to click on the links below to access interviews, videos and photos.